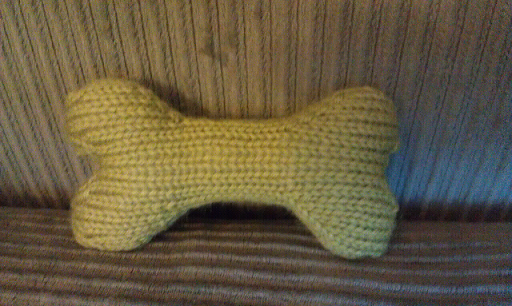 Indy loves his knit ball so much, that I have to make him some other knit dog toys for Christmas. I have loved the project, Fetch! for many years, and am excited to finally have an excuse to make it. I cast on with the magic cast on displayed in this youtube video. 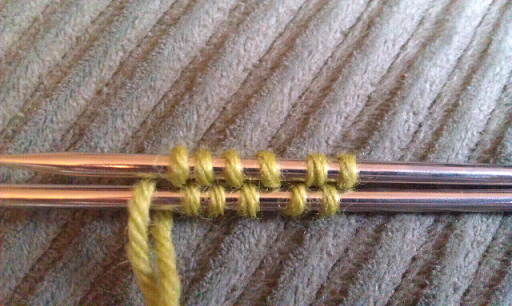 This would gave me 12 stitches onto two needles. This way the end of the bone would start out without a hole. 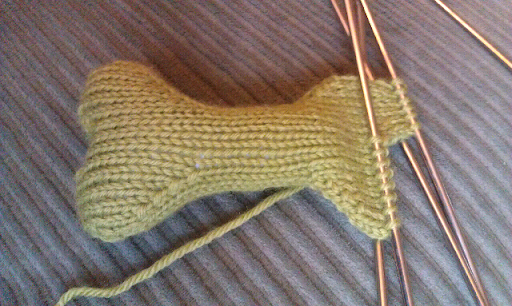 I broke yarn and repeated the magic cast on and knit until I could start knitting the whole bone as directed in the pattern instructions. The two ends of the bone (left). 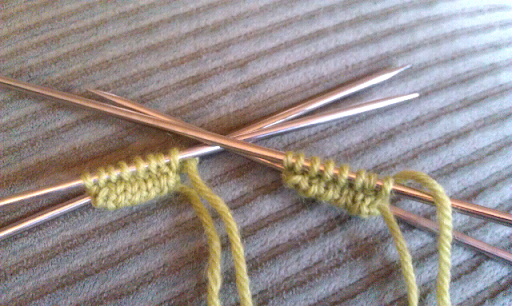 I am now ready to join them together to start knitting the whole bone (right). 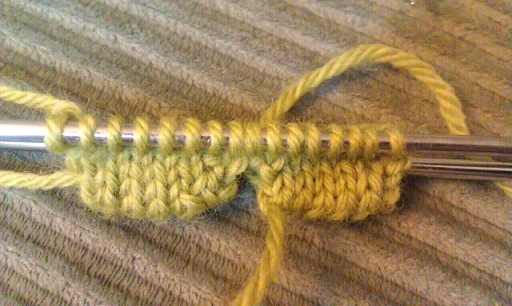 There was a tiny hole in the middle of the two end tips, but I was able to stitch this closed in the blink of an eye. 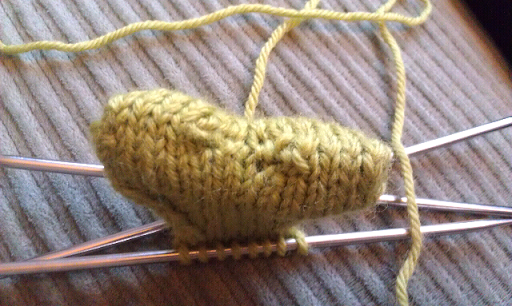 Finishing the bone required nothing complicated, you just deal with half of the stitches at a time. 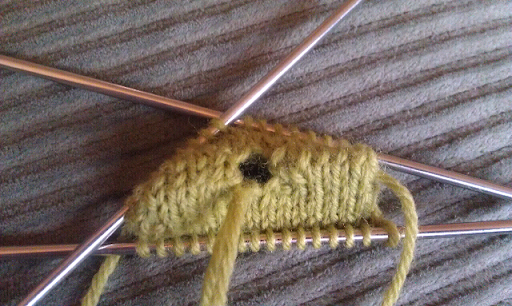 This project required 10 g (1/5 of one ball) of KnitPicks wool of the Andes yarn in Avocado, knitting with size 5 knitting needles. This was a easy and super fast project. I'm glad that I decided to work it in the round! It is a shame Indy cannot have it yet. 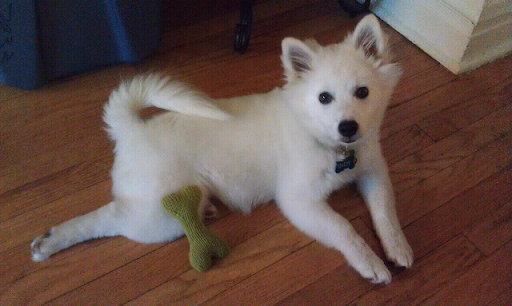 I took a picture of the bone with Indy at 17 weeks, but I didn't let him have the bone yet. It is his Christmas present, after all!